I bought the fabric for this quilt back in December, 2010, on my way to Bunco Night with some girlfriends. I had stopped in Quilter’s Haven a couple weeks earlier and saw a gorgeous little minky quilt, and I knew I wanted to make one. But did I buy the kit? Nope….because I already have more than enough in my stash, and I was STILL working on The Blue One’s Monkey Rag Quilt, so I didn’t buy it. After thinking about/pining for that minky kit, I decided to stop in one night, and of course they didn’t have any kits left. 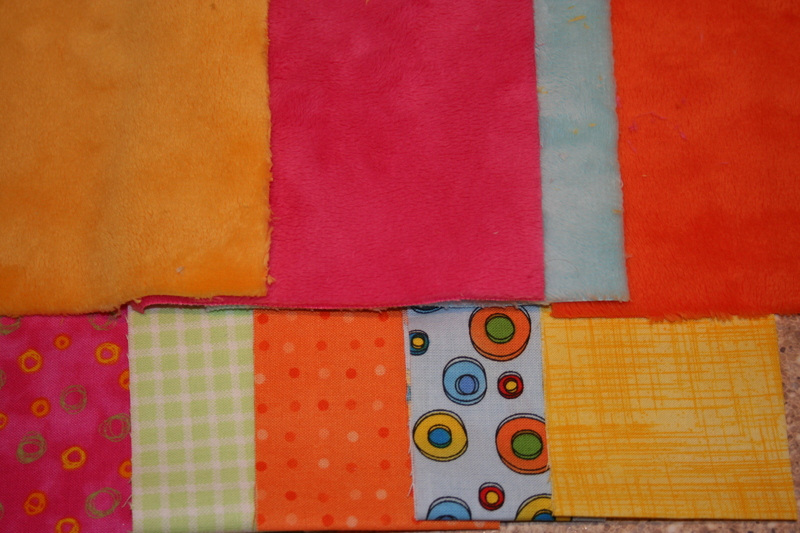 Already running late for Bunco, I now had to pick out fabric for my own Minky quilt. And then I had to hem & haw over the choices and which fabrics to choose. I am pretty happy with the fabrics I wound up with. I wasn’t quite prepared for how difficult it is to sew with minky fabric, and after ripping out a few seams, I figured which edge of fabric to start sewing with. My squares are a little wonky, but heck, my squares are ALWAYS a little wonky! I took it to my local quilt shop, The Quilting Cupboard, to pick out a backing because of course I never buy a back at the same time I buy the other fabric. (Because I never learn my lesson about buying the fabric you want WHEN you see it instead of hunting for it later!) 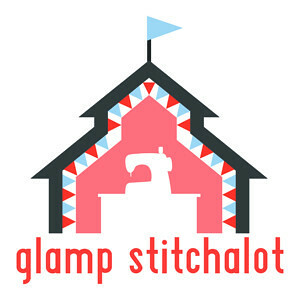 While the shop owner was cutting the fabric for the binding & batting, I told her that she’d see it again very soon – I was bringing it back for her to quilt. She said that the back wouldn’t need to be pieced together, so she could just keep it and she’d add it to her pile (this was a Friday afternoon). On Monday morning, I received a call….she was done already! She said because it was so small, she decided to throw it on her long-arm machine so she could feel like she was actually accomplishing something! I was rather impressed with the quick turnaround, and I know that’s the last time that will ever happen! 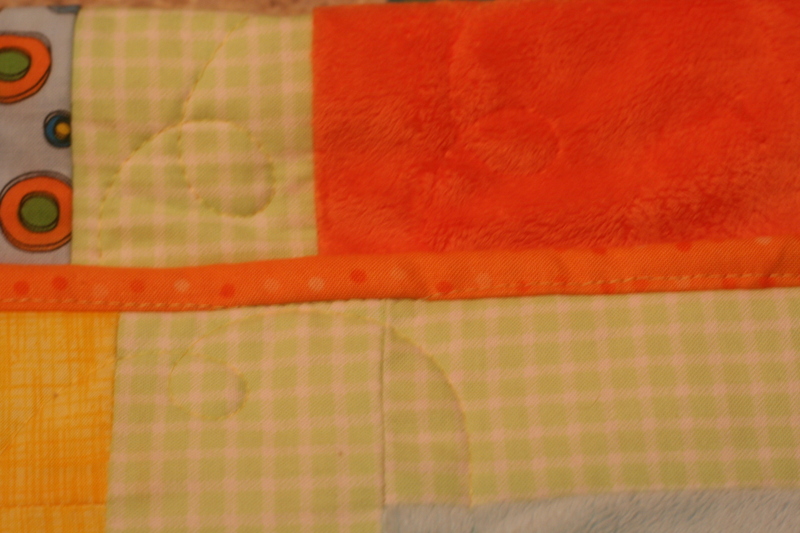 I haven’t actually bound a quilt in several years. 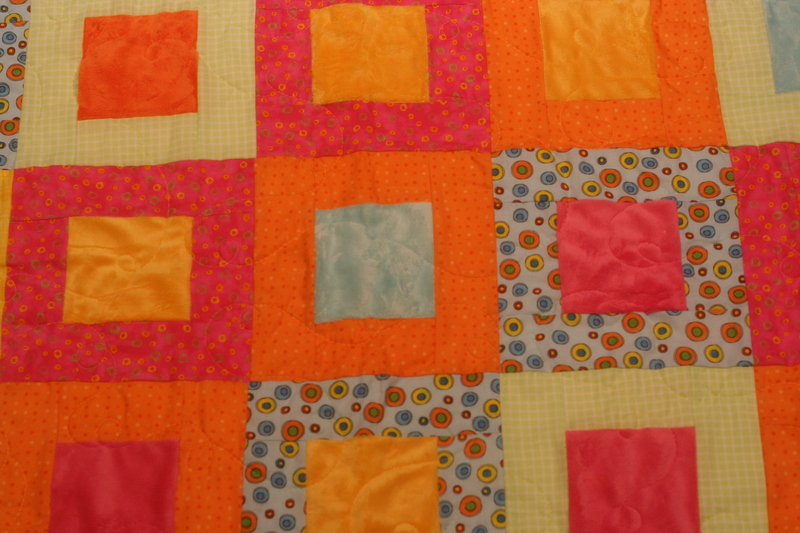 The very first quilt I ever made (I mean started to make) is still in my craft room – with the binding machine sewn on, and pinned on one back edge. I’m really a procrastinator when it comes to hand-stitching, which is evident because I think I finished this top over 10 years ago (GASP!). I have done 2 quilts as gifts for friends, and I know they had binding on them, but I can’t for the life of me remember actually doing it! So I set out to completely machine sew on the binding for this quilt. All went well when I attached the binding to the front of the quilt, but things got a little out of control when I was machine stitching the binding onto the back of the quilt. I’m not entirely too sure what happened. The stitches on the back side were looking good, but when I took it out of my machine and flipped it over to look at the front, every few inches, my stitches dipped down off the binding and onto the quilt squares. This happened all the way around the quilt. There are about 3-4 ‘dips’ from the binding on each side. I’m not too impressed with my binding, to say the least, but it’s my first time doing it with the machine, and I can only hope I will get better at it. 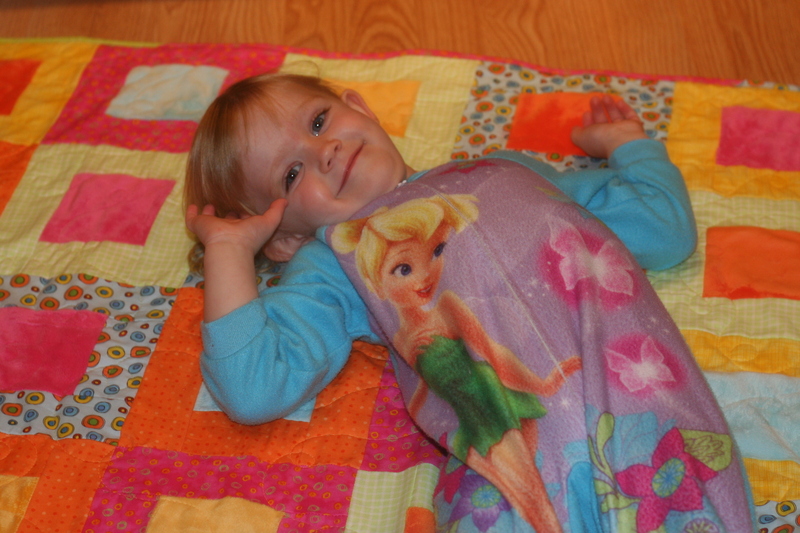 The good thing is – THE QUILT IS COMPLETE! And The Pink One really seemed to like it! She layed on it, wrapped herself up in it, and is now sleeping with it. I think it passed the test! 2 Responses to Minky Quilt = Done! You’re not the first person I’ve heard say that it’s hard to do the binding when using Minky fabric. I guess if you’re going to enjoy the sensational softness there has to be some down side. I don’t think it bothers the little one at all though. Julie – I didn’t use a Minky fabric on the binding, just a regular cotton fabric. My issue comes with my procrastination/complete avoidance when it comes to sewing on a binding in the first place! 🙂 I just need lots more practice with completely machine binding to build up my confidence. Thanks for stopping by and commenting! I absolutely appreciate it!